How much minced lamb have you got? P: For 800g: Mix the lamb mince with a slack handful of very finely chopped spring onions, 2 carlic cloves mashed with 1 tsp salt and an egg. You can add a teaspoon of dried rosemary and a finely chopped hot chilli pepper - both are optional. Other good herbs are marjoram, savoury and of course dried or fresh mint. Chill the mix until it is stiff, then shape it round a chopstick to a 4 inch kofte, then grill or fry. The hollow helps it stay moist and cook fast. Serve with a rice or bulgar wheat pilaff, minted joghurt and chilli sauce, with a nice salad on the side. For wine, something full-blooded like a Rhone red. I prefer beer with it though. P: you can freeze any excess shaped and raw. Cook from frozen. F: I'm planning on making the koftas now then cooking them tomorrow or cook them now and eat cold tomorrow? Thoughts? P: I wish I was, it sounds like you are set for some yummy fun. They take no time to cook, once shaped, and lamb gets too waxy when cold. A cucumber and mint raitha would work well too. Mix cucumber chunks with greek yoghurt and english mint sauce! trust me it works. 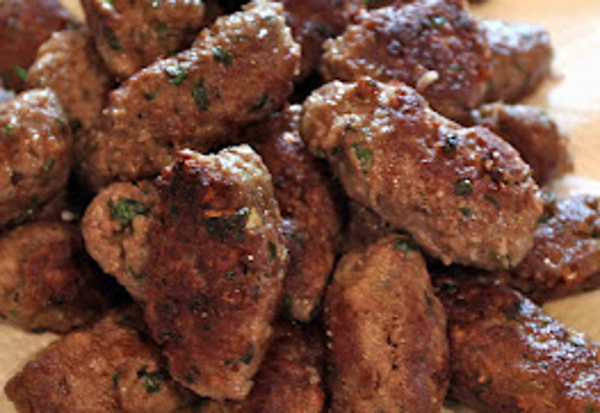 Only pork kofte taste okay cold, but pork kofte are not authentic - even christian arabs don't eat much pork. Can I paste this as a kind of novel way of presenting a recipe? I will sanitise your name if you want.